For other uses, see Bohemia (disambiguation). Bohemia (/boʊˈhiːmiə/ boh-HEE-mee-ə; Czech: Čechy; German: Böhmen (help·info); Polish: Czechy; Latin: Bohemia) is the westernmost and largest historical region of the Czech lands in the present-day Czech Republic. In a broader meaning, Bohemia sometimes refers to the entire Czech territory, including Moravia and Czech Silesia, especially in a historical context, such as the Lands of the Bohemian Crown ruled by Bohemian kings. 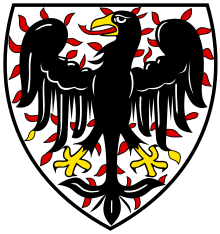 Bohemia was a duchy of Great Moravia, later an independent principality, a kingdom in the Holy Roman Empire, and subsequently a part of the Habsburg Monarchy and the Austrian Empire. 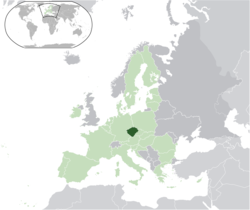 After World War I and the establishment of an independent Czechoslovak state, Bohemia became a part of Czechoslovakia. Between 1938 and 1945, border regions with sizeable German-speaking minorities of all three Czech lands were joined to Nazi Germany as the Sudetenland. The remainder of Czech territory became the Second Czechoslovak Republic and was subsequently occupied as the Protectorate of Bohemia and Moravia. In 1969, the Czech lands (including Bohemia) were given autonomy within Czechoslovakia as the Czech Socialist Republic. In 1990, the name was changed to the Czech Republic, which became a separate state in 1993 with the split of Czechoslovakia. 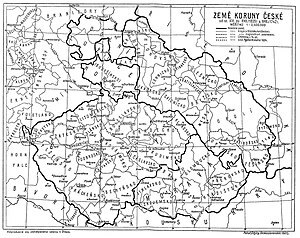 Until 1948, Bohemia was an administrative unit of Czechoslovakia as one of its "lands" ("země"). Since then, administrative reforms have replaced self-governing lands with a modified system of "regions" ("kraje") which do not follow the borders of the historical Czech lands (or the regions from the 1960 and 2000 reforms). However, the three lands are mentioned in the preamble of the Constitution of the Czech Republic: "We, citizens of the Czech Republic in Bohemia, Moravia and Silesia…"
Bohemia had an area of 52,065 km2 (20,102 sq mi) and today is home to approximately 6.5 million of the Czech Republic's 10.5 million inhabitants. Bohemia was bordered in the south by Upper and Lower Austria (both in Austria), in the west by Bavaria and in the north by Saxony and Lusatia (all in Germany), in the northeast by Silesia (in Poland), and in the east by Moravia (also part of the Czech Republic). Bohemia's borders were mostly marked by mountain ranges such as the Bohemian Forest, the Ore Mountains, and the Krkonoše, a part of the Sudetes range; the Bohemian-Moravian border roughly follows the Elbe-Danube watershed. In the 2nd century BC, the Romans were competing for dominance in northern Italy with various peoples including the Gauls-Celtic tribe Boii. The Romans defeated the Boii at the Battle of Placentia (194 BC) and the Battle of Mutina (193 BC). After this, many of the Boii retreated north across the Alps. Much later Roman authors refer to the area they had once occupied (the "desert of the Boii" as Pliny and Strabo called it) as Boiohaemum. The earliest mention was by Tacitus' Germania 28 (written at the end of the 1st century AD), and later mentions of the same name are in Strabo and Velleius Paterculus. The name appears to include the tribal name Boi- plus the Germanic element *haimaz "home" (whence Gothic haims, German Heimat, English home). This Boiohaemum was apparently isolated to the area where King Marobod's kingdom was centred, within the Hercynian forest. Emperor Constantine VII in 10th century De Administrando Imperio also mentioned the region as Boïki (see White Serbia). The Czech name "Čechy" is derived from the name of the Slavic ethnic group, the Czechs, who settled in the area during the 6th or 7th century AD. 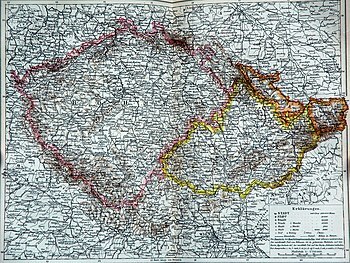 An 1892 map showing Bohemia proper outlined in pink, Moravia in yellow, and Austrian Silesia in orange. Bohemia, like neighbouring Bavaria, is named after the Boii, who were a large Celtic nation known to the Romans for their migrations and settlement in northern Italy and other places. Another part of the nation moved west with the Helvetii into southern France, which was one of the events leading to the interventions of Julius Caesar's Gaulish campaign of 58 BC. The emigration of the Helvetii and Boii left southern Germany and Bohemia a lightly inhabited "desert" into which Suebic peoples arrived, speaking Germanic languages, and became dominant over remaining Celtic groups. To the south, over the Danube, the Romans extended their empire, and to the southeast in present-day Hungary, were Dacian peoples. In the area of modern Bohemia the Marcomanni and other Suebic groups were led by their king Marobodus, after suffering defeat to Roman forces in Germany. He took advantage of the natural defenses provided by its mountains and forests. They were able to maintain a strong alliance with neighbouring tribes including (at different times) the Lugii, Quadi, Hermunduri, Semnones, and Buri, which was sometimes partly controlled by the Roman Empire, and sometimes in conflict with it, for example in the second century when they fought Marcus Aurelius. In late classical times and the early Middle Ages, two new Suebic groupings appeared to the west of Bohemia in southern Germany, the Alemanni (in the Helvetian desert), and the Bavarians (Baiuvarii). Many Suebic tribes from the Bohemian region took part in such movements westwards, even settling as far away as Spain and Portugal. With them were also tribes who had pushed from the east, such as the Vandals, and Alans. Other groups pushed southwards towards Pannonia. The last known mention of the kingdom of the Marcomanni, concerning a queen named Fritigil is in the 4th century, and she was thought to have lived in or near Pannonia. The Suebian Langobardi, who moved over many generations from the Baltic Sea, via the Elbe and Pannonia to Italy, recorded in a tribal history a time spent in "Bainaib". After this migration period, Bohemia was partially repopulated around the 6th century, and eventually Slavic tribes arrived from the east, and their language began to replace the older Germanic, Celtic and Sarmatian ones. These are precursors of today's Czechs, though the exact amount of Slavic immigration is a subject of debate. The Slavic influx was divided into two or three waves. The first wave came from the southeast and east, when the Germanic Lombards left Bohemia (c. 568 AD). Soon after, from the 630s to 660s, the territory was taken by Samo's tribal confederation. His death marked the end of the old "Slavonic" confederation, the second attempt to establish such a Slavonic union after Carantania in Carinthia. Other sources (Descriptio civitatum et regionum ad septentrionalem plagam Danubii, Bavaria, 800–850) divide the population of Bohemia at this time into the Merehani, Marharaii, Beheimare (Bohemani) and Fraganeo. (The suffix -ani or -ni means "people of-"). Christianity first appeared in the early 9th century, but only became dominant much later, in the 10th or 11th century. The 9th century was crucial for the future of Bohemia. The manorial system sharply declined, as it did in Bavaria. The influence of the central Fraganeo-Czechs grew, as a result of the important cultic centre in their territory. They were Slavic-speaking and thus contributed to the transformation of diverse neighbouring populations into a new nation named and led by them with a united slavic ethnic consciousness. The coat of arms of the Přemyslid dynasty (until 1253-62). Bohemia was made a part of the early Slavic state of Great Moravia, under the rule of Svatopluk I (r. 870–894). After Svatopluk's death Great Moravia was weakened by years of internal conflict and constant warfare, ultimately collapsing and fragmenting due to the continual incursions of the invading nomadic Magyars. Bohemia's initial incorporation into the Moravian Empire resulted in the extensive Christianization of the population. 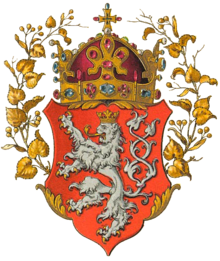 A native monarchy arose to the throne, and Bohemia came under the rule of the Přemyslid dynasty, which would rule the Czech lands for the next several hundred years. The Přemyslids secured their frontiers from the remnant Asian interlocurs, after the collapse of the Moravian state, by entering into a state of semi-vassalage to the Frankish rulers. This alliance was facilitated by Bohemia's conversion to Christianity, in the 9th century. Continuing close relations were developed with the East Frankish kingdom, which devolved from the Carolingian Empire, into East Francia, eventually becoming the Holy Roman Empire. After a decisive victory of the Holy Roman Empire and Bohemia over invading Magyars in the 955 Battle of Lechfeld, Boleslaus I of Bohemia was granted the March of Moravia by German emperor Otto the Great. Bohemia would remain a largely autonomous state under the Holy Roman Empire for several decades. The jurisdiction of the Holy Roman Empire was definitively reasserted when Jaromír of Bohemia was granted fief of the Kingdom of Bohemia by Emperor King Henry II of the Holy Roman Empire, with the promise that he hold it as a vassal once he re-occupied Prague with a German army in 1004, ending the rule of Boleslaw I of Poland. The first to use the title of "King of Bohemia" were the Přemyslid dukes Vratislav II (1085) and Vladislav II (1158), but their heirs would return to the title of duke. The title of king became hereditary under Ottokar I (1198). His grandson Ottokar II (king from 1253–1278) conquered a short-lived empire which contained modern Austria and Slovenia. The mid-13th century saw the beginning of substantial German immigration as the court sought to replace losses from the brief Mongol invasion of Europe in 1241. 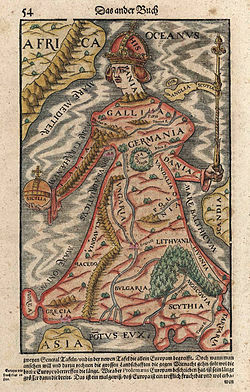 Germans settled primarily along the northern, western, and southern borders of Bohemia, although many lived in towns throughout the kingdom. The House of Luxembourg accepted the invitation to the Bohemian throne with the marriage to the Premyslid heiress, Elizabeth and the crowning subsequent of John I of Bohemia in 1310. His son, Charles IV became King of Bohemia in 1346. He founded Charles University in Prague, central Europe's first university, two years later. His reign brought Bohemia to its peak both politically and in total area, resulting in his being the first King of Bohemia to also be elected as Holy Roman Emperor. Under his rule the Bohemian crown controlled such diverse lands as Moravia, Silesia, Upper Lusatia and Lower Lusatia, Brandenburg, an area around Nuremberg called New Bohemia, Luxembourg, and several small towns scattered around Germany. During the ecumenical Council of Constance in 1415, Jan Hus, the rector of Charles University and a prominent reformer and religious thinker, was sentenced to be burnt at the stake as a heretic. The verdict was passed despite the fact that Hus was granted formal protection by Emperor Sigismund of Luxembourg prior to the journey. Hus was invited to attend the council to defend himself and the Czech positions in the religious court, but with the emperor's approval, he was executed on 6 July 1415. The execution of Hus, as well as five consecutive papal crusades against followers of Hus, forced the Bohemians to defend themselves in the Hussite Wars. The uprising against imperial forces was led by a former mercenary, Jan Žižka of Trocnov. As the leader of the Hussite armies, he used innovative tactics and weapons, such as howitzers, pistols, and fortified wagons, which were revolutionary for the time, and established Žižka as a great general who never lost a battle. After Žižka's death, Prokop the Great took over the command for the army, and under his lead the Hussites were victorious for another ten years, to the sheer terror of Europe. The Hussite cause gradually splintered into two main factions, the moderate Utraquists and the more fanatic Taborites. The Utraquists began to lay the groundwork for an agreement with the Catholic Church and found the more radical views of the Taborites distasteful. Additionally, with general war-weariness and yearning for order, the Utraquists were able to eventually defeat the Taborites in the Battle of Lipany in 1434. Sigismund said after the battle that "only the Bohemians could defeat the Bohemians." Despite an apparent victory for the Catholics, the Bohemian Utraquists were still strong enough to negotiate freedom of religion in 1436. This happened in the so-called Basel Compacts, declaring peace and freedom between Catholics and Utraquists. It would only last for a short period of time, as Pope Pius II declared the Basel Compacts to be invalid in 1462. In 1458, George of Podebrady was elected to ascend to the Bohemian throne. He is remembered for his attempt to set up a pan-European "Christian League", which would form all the states of Europe into a community based on religion. In the process of negotiating, he appointed Leo of Rozmital to tour the European courts and to conduct the talks. However, the negotiations were not completed, because George's position was substantially damaged over time by his deteriorating relationship with the Pope. After the death of King Louis II of Hungary and Bohemia in the Battle of Mohács in 1526, Archduke Ferdinand I of Austria became the new King of Bohemia and the country became a constituent state of the Habsburg Monarchy. Bohemia enjoyed religious freedom between 1436 and 1620, and became one of the most liberal countries of the Christian world during that period. In 1609, Holy Roman Emperor Rudolph II, who made Prague again the capital of the Empire at the time, himself a Roman Catholic, was moved by the Bohemian nobility to publish Maiestas Rudolphina, which confirmed the older Confessio Bohemica of 1575. After Emperor Matthias II and then King of Bohemia Ferdinand II (later Holy Roman Emperor) began oppressing the rights of Protestants in Bohemia, the resulting Bohemian Revolt led to outbreak of the Thirty Years' War in 1618. Elector Frederick V of the Electorate of the Palatinate, a Calvinist Protestant, was elected by the Bohemian nobility to replace Ferdinand on the Bohemian throne, and was known as the Winter King. Frederick's wife, the popular Elizabeth Stuart and subsequently Elizabeth of Bohemia, known as the Winter Queen or Queen of Hearts, was the daughter of King James VI of Scotland. After Frederick's defeat in the Battle of White Mountain in 1620, 27 Bohemian estates leaders together with Jan Jesenius, rector of the Charles University of Prague were executed on the Prague's Old Town Square on 21 June 1621 and the rest were exiled from the country; their lands were then given to Catholic loyalists (mostly of Bavarian and Saxon origin), this ended the pro-reformation movement in Bohemia and also ended the role of Prague as ruling city of the Holy Roman Empire. In the so-called "renewed constitution" of 1627, the German language was established as a second official language in the Czech lands. The Czech language formally remained the first language in the kingdom, however, both German and Latin were widely spoken among the ruling classes, although German became increasingly dominant, while Czech was spoken in much of the countryside. The formal independence of Bohemia was further jeopardized when the Bohemian Diet approved administrative reform in 1749. It included the indivisibility of the Habsburg Empire and the centralization of rule; this essentially meant the merging of the Royal Bohemian Chancellery with the Austrian Chancellery. At the end of the 18th century, the Czech National Revival movement, in cooperation with part of the Bohemian aristocracy, started a campaign for restoration of the kingdom's historic rights, whereby the Czech language was to regain its historical role and replace German as the language of administration. The enlightened absolutism of Joseph II and Leopold II, who introduced minor language concessions, showed promise for the Czech movement, but many of these reforms were later rescinded. During the Revolution of 1848, many Czech nationalists called for autonomy for Bohemia from Habsburg Austria, but the revolutionaries were defeated. The old Bohemian Diet, one of the last remnants of the independence, was dissolved, although the Czech language experienced a rebirth as romantic nationalism developed among the Czechs. In 1861, a new elected Bohemian Diet was established. The renewal of the old Bohemian Crown (Kingdom of Bohemia, Margraviate of Moravia, and Duchy of Upper and Lower Silesia) became the official political program of both Czech liberal politicians and the majority of Bohemian aristocracy ("state rights program"), while parties representing the German minority and small part of the aristocracy proclaimed their loyalty to the centralistic Constitution (so-called "Verfassungstreue"). After the defeat of Austria in the Austro-Prussian War in 1866, Hungarian politicians achieved the Austro-Hungarian Compromise of 1867, ostensibly creating equality between the Austrian and Hungarian halves of the empire. An attempt by the Czechs to create a tripartite monarchy (Austria-Hungary-Bohemia) failed in 1871. The "state rights program" remained the official platform of all Czech political parties (except for social democrats) until 1918. Bohemia (westernmost area) in Czechoslovakia 1918–1938. Linguistic map of interwar Czechoslovakia (c. 1930). After World War I, Bohemia (as the largest and most populous land) became the core of the newly formed country of Czechoslovakia, which combined Bohemia, Moravia, Czech Silesia, Upper Hungary (present-day Slovakia) and Carpathian Ruthenia into one state. Under its first president, Tomáš Masaryk, Czechoslovakia became a liberal democratic republic but serious issues emerged regarding the Czech majority's relationship with the native German and Hungarian minorities. Following the Munich Agreement in 1938, the border regions of Bohemia historically inhabited predominantly by ethnic Germans (the Sudetenland) were annexed to Nazi Germany. This was the only time in Bohemian history that its territory was politically divided. The remnants of Bohemia and Moravia were then annexed by Germany in 1939, while the Slovak lands became the separate Slovak Republic, a puppet state of Nazi Germany. From 1939 to 1945 Bohemia, (without the Sudetenland), together with Moravia formed the German Protectorate of Bohemia and Moravia (Reichsprotektorat Böhmen und Mähren). Any open opposition to German occupation was brutally suppressed by the Nazi authorities and many Czech patriots were executed as a result. After World War II ended in 1945, the vast majority of remaining Germans were expelled by force by the order of the re-established Czechoslovak central government, based on the Potsdam Agreement, and their property was confiscated by the Czech authorities. This severely depopulated the area and from this moment on locales were only referred to in their Czech equivalents regardless of their previous demographic makeup. The Communist Party won the most votes in free elections but not a simple majority. Klement Gottwald, the communist leader, became Prime Minister of a coalition government. In February 1948 the non-communist members of the government resigned in protest against arbitrary measures by the communists and their Soviet protectors in many of the state's institutions. Gottwald and the communists responded with a coup d'état and installed a pro-Soviet authoritarian state. In 1949, Bohemia ceased to be an administrative unit of Czechoslovakia, as the country was divided into administrative regions that did not follow the historical borders. In 1989, Agnes of Bohemia became the first saint from a Central European country to be canonized by Pope John Paul II before the "Velvet Revolution" later that year. 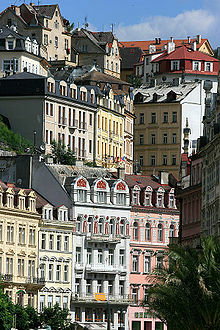 After the dissolution of Czechoslovakia in 1993, the territory of Bohemia remained in the Czech Republic. The new Constitution of the Czech Republic provided for higher administrative units to be established, providing for the possibility of Bohemia as an administrative unit, but did not specify the form they would take. 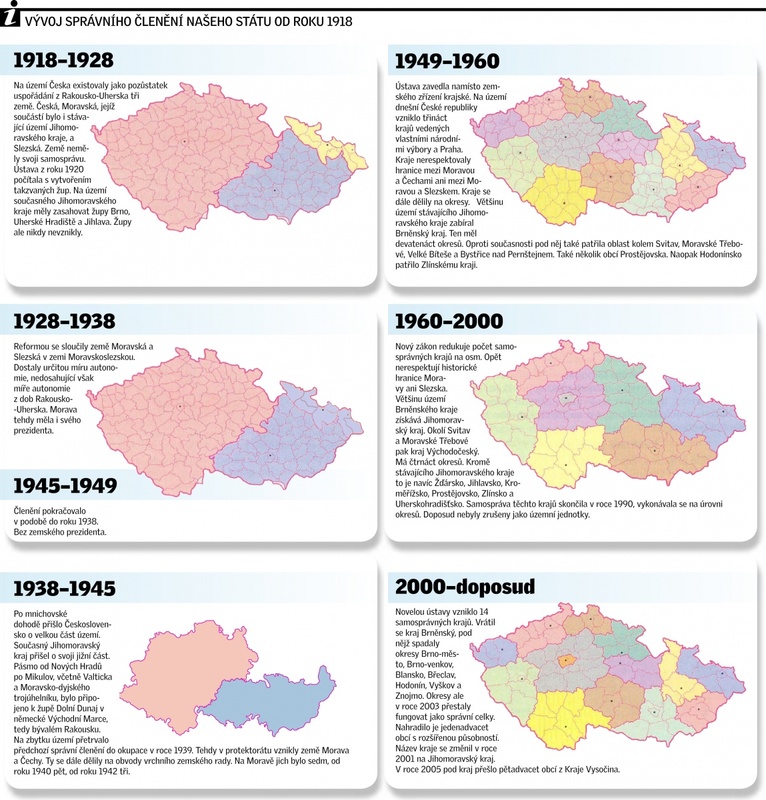 A constitutional act in 1997 rejected the restoration of self-governing historical Czech lands and decided for the regional system that has been in use since 2000. Petr Pithart, former Czech prime minister and president of the Senate at the time, remained one of the main advocates of the land system, claiming that the primary reason for its refusal was the fear of possible Moravian separatism. Bohemia thus remains a historical region, and its administration is divided between the Prague, Central Bohemia, Plzeň, Karlovy Vary, Ústí nad Labem, Liberec, and Hradec Králové Regions, as well as parts of the Pardubice, Vysočina, South Bohemian and South Moravian Regions. In addition to their use in the names of the regions, the historical land names remain in use in names of municipalities, cadastral areas, railway stations or geographical names. The distinction and border between the Czech lands is also preserved in local dialects. The area around Kłodzko (Czech: Kladsko; German: Glatz; Latin: Glacio) in south-western Poland was culturally and traditionally a part of Bohemia. Kłodzko Land has now been a part of Lower Silesia since its conquest by the Kingdom of Prussia in 1763. Referred to as "Little Prague" (German: Klein-Prag), the Kłodzko Valley region on the Nysa Kłodzka river was the focus of several attempts to reincorporate the area into Czechoslovakia, one of several Polish–Czechoslovak border conflicts. The last attempt occurred in May 1945 when Czechoslovakia tried to annex the area on behalf of the Czech minority present in the western part of the Kłodzko Valley and known as the "Czech Corner". Pressure brought on by the Soviet Union led to a ceasing of military operations, with the Czech minority being expelled to Germany and Czechoslovakia. According to canon law of the Roman Catholic Church, the area remained part of the Roman Catholic Archdiocese of Prague until 1972. Capitalizing on interest regarding the Kladsko area in the Czech national psyche, a special tourist area in the Náchod District has been designated as the Kladsko Borderland Tourist Area (tourism district; Czech: turistická oblast Kladské pomezí). This area, entirely within the Czech Republic, was formerly known as the Jirásek's Region (Czech: Jiráskův kraj), Adršpach rocks (Czech: Adršpašské skály). A panorama of Kłodzko, the capital city of Kłodzko Land which is referred to as "Little Prague". ^ "Bohemia". Random House Webster's Unabridged Dictionary. ^ There is no distinction in the Czech language between adjectives referring to Bohemia and to the Czech Republic; i.e. český means both Bohemian and Czech. ^ Jiří Pehe: Co vlastně slavíme 28. října? ^ a b "Bohemia". Retrieved 2 June 2012. ^ "Tacitus: Germania". Thelatinlibrary.com. Retrieved 2013-11-19. ^ "Portál veřejné správy". portal.gov.cz. ^ Seznam železničních stanic, List of railway stations, České dráhy (Czech railways) – seek for "v Čechách" (17×), "na Moravě" (15×), "Český", "České", "Moravský", "Moravské" etc. ^ interactive, inCUBE. "Story Landscape - Kladsko Borderland, Glatz Borderlan". www.kladskepomezi.cz. Wikisource has the text of the Encyclopaedia Britannica (9th ed.) article Bohemia. Wikisource has the text of the 1911 Encyclopædia Britannica article Bohemia.